Our teeth have three layers. The innermost layer contains the pulpy material that makes up the tooth’s nerve. 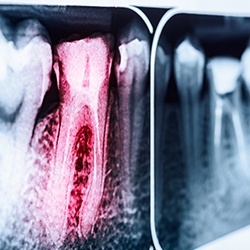 Sometimes, because of a deep cavity or an injury, bacteria can get inside this layer and cause an infection that kills the pulp, stimulates blood flow, and creates pressure inside the tooth. If left untreated, you may need to have your infected tooth extracted. However, if treated quickly with root canal therapy, your tooth can be saved instead. Why Choose Us for Root Canal Therapy? 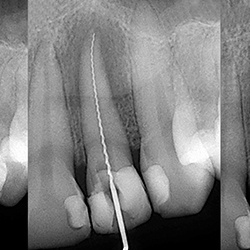 During a root canal, Dr. Boehmer will remove your nerve and any trace of infection from inside the tooth. Then she will fill it with a safe, biocompatible substance and cover it with a protective crown that restores your tooth’s structure, strength, and appearance. Are you experiencing a severe toothache, sensitivity to hot or cold foods and drinks, or swelling/tenderness? Let us evaluate your situation and make a treatment recommendation. A root canal may be what you need to enjoy good oral health and wellbeing again.